An offensive leader for Lake Superior in his 3 seasons, J.T. Henke signed a contract with the ECHL’s Greenville Swamp Rabbits (Mike Barrett/LHB). GREENVILLE, S.C. — A Lakers senior has signed a professional contract. Forward J.T. Henke has signed an entry-level contract with the Greenville Swamp Rabbits of the ECHL. A native of Trenton, Michigan, Henke joined the Lakers after playing a season at the University of Maine. 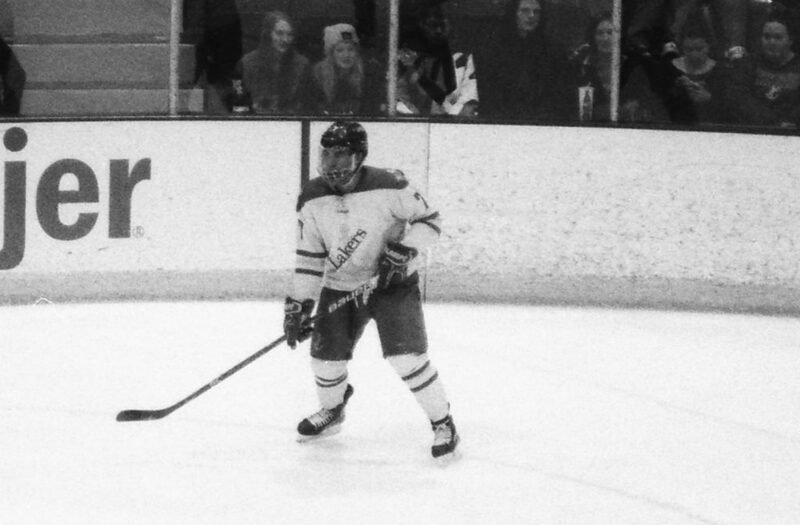 With Lake Superior, Henke has scored at least 22 points in each of his three seasons. During his sophomore and senior campaigns, he led the team in scoring with 22 and 27 points, respectively. His best season was his junior year, when he had 30 points, second on the team behind Mitch Hults. That season saw him named the recipient of the Soo Blue Liner Award, as voted by the Blue Liner Club. As a nod to his scoring prowess, Henke is the most recent Laker to record a hat trick, which he did Friday, October 30, 2015 against Alabama Huntsville. Despite his offensive prowess, he was honored by the Western Collegiate Hockey Association (WCHA) only once as Offensive Player of the Week — when he had five points against Michigan Tech on October 13-14. On that weekend, Henke factored in on all five Laker goals. Henke will join former Lakers Austin McKay, Garret Clemment and Matt Johnson on the Swamp Rabbits roster. An affiliate of the New York Rangers, the Swamp Rabbits have been around since 1987, when they were established in Johnstown, Pennsylvania as the Chiefs (a homage to the 1977 hockey film Slap Shot). They came to Greenville in 2010, becoming the Road Warriors, before changing their name to the Swamp Rabbits in 2015.